Considering a relationship with a marketing partner is a big decision. Maybe it’s your first time, you’re a bit green, not sure what to expect. Maybe it’s not your first rodeo and you’re a bit gun shy, jaded or skeptical (because say what you will about scorned women, but in my experience, hell hath no fury like an exec when presented with underwhelming ROI). So let’s talk through what it takes to find the best marketing partner for your business, what to look for and how to make a smart choice. Like dating (unfortunately), there’s no silver bullet, and what’s best for one business isn’t necessarily best for yours. 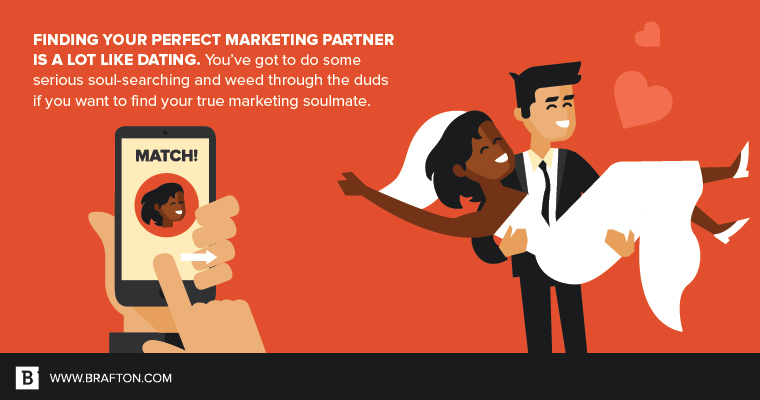 Before the hunt: What are we looking for in our marketing soulmate? What marketing efforts are most essential to serving your commercial goals? In some instances, you might not be sure how to answer this question. That can mean one of two things. Either your team needs to more clearly define your commercial goals and what marketing support can and should be. Or your team could use a more strategic partner to help you determine the role marketing can play to support these goals. Are you looking for support for a finite amount of time to fill an internal gap, or are you looking for a long-term partner to add incremental value to your company and support to your teams? What do you expect of your marketing partner? A marketing partnership is going to require the engagement of multiple people at your business. Determine who those people will be and have a frank discussion about expectations. Looking at the big picture, what do we need a partner for? Is it strategy development? Content creation? Or perhaps expertise of all things digital? What level of communication are we expecting? Daily scrums? Weekly touch base? Monthly review and planning? What types of deliverables do we need? Be sure to consider content types, reports, planning and tracking documents. What outcomes are we looking for? Is it lead generation? Lower cost per lead? Increased market share or revenue? How are we going to measure success of the partnership? Once you determine the outcomes and goals you’re looking for, consider what those things really mean and how you can quantitatively measure them. What timelines are we looking for? Determine how quickly you need to get ramped up, and evaluate what deadlines for marketing-supported initiatives are already set that you need to plan for. What flexibility do we need? Few things can affect a relationship like inflexibility. While planning and structure are vital to a successful strategy, things happen and changes may be necessary. Whether it’s contract terms, communication or strategy, willingness to be flexible are important. Digital marketing is fluid; your partner should be too. What are we willing to invest? It’s harsh, but you get what you pay for. How much responsibility you plan to charge your partner with should correlate with how much budget you are willing to invest with them. Ask the right questions – It’s a two-way street my friends. And I know what you’re thinking… More questions??? Where are the answers, Morgan? Patience, my friends, I promise I’m getting there. But like any good relationship you need to make an effort in the beginning to understand yourself and what you’re looking for so that your romance can blossom into a match made in heaven. Who’s the main point of contact? What management support is offered? How many accounts do various team members own? These questions will help you determine whether there’s a strong internal structure on your partner’s side. You’ll want to feel confident there is oversight and support, from both a service/quality perspective as well as strategic/creative. Bigger isn’t always better, and boutique isn’t always what it seems. Understanding the size of a company can help indicate their expertise, bandwidth and capabilities – all of which will hold varying levels of significance for each stakeholder. Do you have any experience or expertise in my industry? Understanding whether a prospective partner has had experience and success developing and executing marketing strategies in your industry is certainly meaningful. However, keep in mind that you and your team are always going to be the experts when it comes to the nuances of your industry. Committing to marrying your industry expertise with their marketing expertise is going to bring you the most success. Ask for case studies, success stories or references to get meaningful evidence that they’re walking the walk. Strong partners will understand the importance of providing you with such, and will have prepared to make them available. 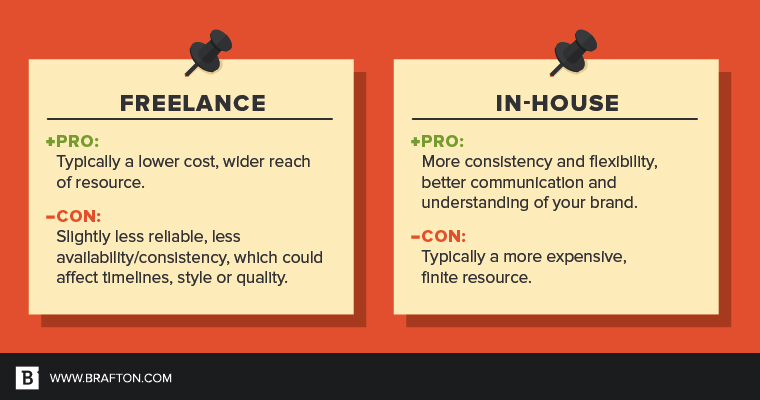 Is your creative team in-house or freelance? Agencies/partners will likely utilize freelance or live-in (jk) in-house creative staffs. Having worked at agencies with both models, I can confidently say there are pros and cons to each. There’s certainly no hard and fast winner, but each structure has implications that will need to line up with what you’re looking for. Let’s pretend you’re speed-dating for a marketing partner. You’ve met with a bunch of suitors and received a lot of great pitches, some canned responses and off-the-stiff-red-cuff (cough, prepared) ideas. But you need to pop the well-prepped sales bubble to get to the honest core of a company before you agree to a second date, or a proposal (the paper kind, not the diamond kind). I know, it seems simple and even cliche (read: My hobbies include traveling and trying new things! ), but putting them on the spot with this question will reveal genuine differentiators between marketing providers. *Bear in mind these questions could come at various stages (ie. discovery, proposal, kick-off etc.). Why are you exploring a marketing partnership? A strong partner wants to understand where the initial pain point (and need for help) arose so they can be effective. Are you filling a gap or looking for a long-term engagement? There’s no better answer here, so be honest when explaining the envisioned timeline for your engagement. It will help your partner plan more strategically. What are meaningful metrics and KPIs you’ll look at to measure success? If a partner isn’t asking this question, they’re not focused on meeting expectations. Even with soft goals (i.e. thought leadership, brand awareness, etc. ), you and your partner should be on the same page about how their success and effectiveness will be evaluated. This allows for strong strategy planning and eliminates ambiguity down the line. What are your company’s commercial goals for this quarter or year? How do you envision marketing supporting these goals? How is the marketing team evaluated? Have goals historically been met? You may be thinking, “Woah woah, we’ve got a stage 5 clinger on our hands here.” And while I understand not wanting to give away the family secrets on the first date, don’t view these questions as prying or overstepping. A good partner sees the need to understand the big picture of your business as a whole so they can develop and execute the strongest strategy. The key to a happy marriage may be compromise, but the key to a happy partnership is strong and consistent communication. Set expectations and dates for weekly and monthly touchpoints. Agree on cadence and format for reporting. Direct access to your main point of contact when needed with reasonable response time. Ghosting isn’t cool when you’re dating, and unacceptable (aka more expensive) with a marketing partner you’re relying on. Have I beat the relationship metaphor to death yet? Nope? Ok, one more then. I know you’ve been in the situation where your girlfriend/manfriend/husband/wife/SO/dog brings up something that you did wrong months ago and uses it as fuel for their current complaint. And you’re left thinking, “Why didn’t you tell me that sooner so I could fix it?” Say no and I’ll show you a liar. Same rule applies here. Confrontation isn’t easy, no matter the circumstance, but letting your partner know where they’re falling short or not meeting expectations gives them an opportunity to course-correct and give you what you’re looking for. Your partner should be offering the opportunity to provide honest feedback, and you should be taking them up on it. If you’re looking for a true partner, they should be empowered to come to you with new ideas, trends, recommendations, etc., and you should be open to hearing and discussing them. Regardless of the depth, length or motivation of the partnership, choosing a partner is serious business. In a lot of ways it’s like hiring new employees for your business, so treat it as such. Take the time to determine what you expect, what you’re looking for and what’s valuable to your business. And my last piece of advice is this: Don’t lose the human element when you engage with a partner, or underestimate the value of enjoying the people you’d be hiring as a marketing partner. You’ll be spending a lot of time communicating and creating with these folks, via email, on the phone and hopefully in person now and again. Enjoying working with them will undoubtedly lead to a more fruitful, valuable partnership. Morgan is an Account Director in Brafton's Boston headquarters. Writing this bio has made her realize she needs to find more exciting hobbies. Tweet her @morgan_jane5 with suggestions.